President Moon Jae-in of South Korea ordered government departments related to South Korean economy to establish ideas on ‘innovative growth’ and to prepare comprehensive measures as soon as possible. He also acknowledged that his government focused too much on policies regarding ‘fairness and distribution’ and did not look much after policies on ‘innovative growth’ that creates future businesses in detail. He also expressed his will to supplement policies on ‘innovative growth’ as soon as possible. It is expected that policies on ‘innovative growth’ will be established and revised as soon as possible as President Mon ordered for ‘innovative growth’ through a public statement. While his statement rebukes his government departments that are related to South Korean economy that they did not do a satisfactory job overall in an area of innovative growth, it also indicates that he will support them on their plans and decisions in the future. Innovative growth is a strategy that attempts to have entire industries grow through preparation of new national driving forces from an aspect of supply rather than an aspect of demands that emphasize ‘income-lead growth’ and ‘fair economy’ out of his policies on economy. President Moon’s government put out variety of policies on jobs, income-led growth, and fair economy after he was appointed as the president of South Korea. However it did not put out much policies on innovative growth such as Industry 4.0., recovery of exports, and restructuring for different types of businesses. Some even criticized his government by saying that industrial policies are missing when there are not any discussions even when pending issues are accumulated. President Moon also assessed himself that he did not push for innovative growth fully. Although Ministry of SMEs and Startups and Industry 4.0 Committee were established to help with innovative growth, selection process for the minister of Ministry of SMEs and Startups is not finished and the committee also went through many twists and turns such as controversy on lowering of status during an establishment process. “It feels that innovative growth is not being pushed on full-scale as the minister has yet to be appointed for Ministry of SMEs and Startups and Industry 4.0 Committee has yet to get off the ground.” said President Moon. Fact that President Moon mentioned ‘innovative growth’ as the main agenda indicates that it is also related to prediction of South Korea’s economic growth that was recently announced. On the 19th of September, The Bank of Korea’s Monetary Policy Committee predicted economic growth rate and rate of inflation in 2018 to be 2.8% and back-end of 1% respectively. This prediction falls short of South Korean Government’s prediction that estimated 3% of growth in 2018 through compilation of revised supplementary budget. Number of employees has been its lowest for several days and creation of new jobs through innovative growth is very urgent. 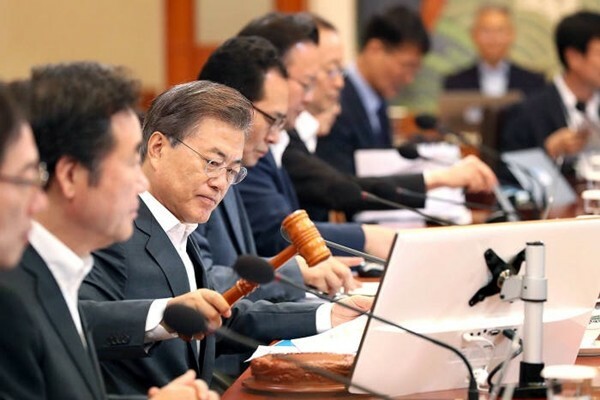 It seems that an order made by President Moon on innovative growth will be visualized as soon as possible as it engages both establishment of Industry 4.0 Committee and mutual-assistant system between parties and South Korean Government. President Moon actually appointed Chairman Jang Byung-kyu of the board of directors of Bluehole as the chairman of Industry 4.0 Committee on the 25th of September. On the first day of establishment of Industry 4.0 Committee, Ministry of Science and ICT and Industry 4.0 Committee held an ‘open forum for Industry 4.0’ and listened to opinions from experts in variety of fields and the public. It is going to have its official meeting right after Thanksgiving holiday and prepare roadmaps for direction of its strategies. In December, it is going to put out detailed strategies for each industry. “We are going to push for shot-term plans after establishing the order of priority and focus on areas where public relations and citizens in South Korea can relate to. The Minjoo Party of Korea is also going to support vitalization of innovative growth. On this day, it chose innovation of regulations, innovation of finance, and scale-up support as three preceding tasks for innovative growth. It is also going to work on establishing and revising laws that are related to innovative growth as soon as possible.